Chiefs crashed out of the MTN8 after losing 3-2 on aggregate to SuperSport over the weekend. Amakhosi lost 3-2 on aggregate after the first leg in Pretoria just over a week ago ended in a 2-2 draw. Bradley Grobler scored in the second half to earn Matsatsantsa a spot in the final. Solinas went into the match with a much-changed team and a new system, but it didn’t work out. Chiefs were not as fluid in attack as they had been in previous matches. “The idea was to cover our defence,” said Solinas of the changed formation that saw Wiseman Meyiwa’s partner Willard Katsande in the centre of midfield and Siphelele Ntshangase pushed forward a little. “We put Wiseman there to help Katsande in the middle because SuperSport play three in the middle. We wanted to protect the defence. We put Ntshangase further forward, like a No 10, to provide the passes for our strikers but it didn’t work in the first half. Our combinations were not positive. We did better in the second half and it is a pity we conceded the goal. It is disappointing,” added the Italian. 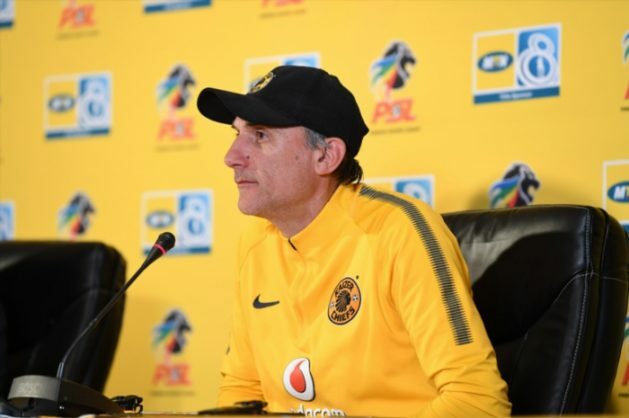 Missing out of the MTN8 is a big blow for Chiefs who have not lifted a trophy in over three years now and while Solinas understands how disappointing it is, he believes all is not lost. “We all wanted this final. We needed it. We have lost an opportunity to win a trophy,” he admitted. “But we need to move on. This is life, this is football. I don’t have a magic wand. I have been here for a month-and-a-half. We need to work hard and we need time. I am happy with the effort. This team will give our supporters satisfaction in future.